Once again, I didn’t get the exclusive on a composer I thought for sure was so obscure that nothing by him would ever have been reviewed in Fanfare before. Granted, it has been a while, but back in 1999 (22:3) Robert Maxham reviewed a disc of Zani concertos, and over a year-and-a-half later, the same CD was received by Michael Carter for a second review in 24:1. 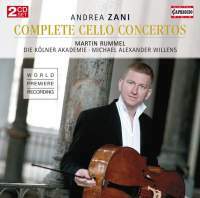 Still, I’m left here with one scoop: Zani’s 12 cello concertos on this new Capriccio release are world premiere recordings. Andrea Teodoro Zani (1696–1757) was born in Casalmaggiore, a province of Cremona, long a center for famous makers of string instruments. Zani, in fact, is virtually an exact contemporary of the most famous of the Guarneris, Cremonese luthier Giuseppe Guarneri “del Gesù” (1698–1744), and of famed Italian violinist-composers, Veracini (1690–1768), Tartini (1692–1770), and Locatelli (1695–1764). It’s no surprise then that Zani trained as a violinist, and upon hearing him play, Antonio Caldara invited the young man to accompany him to Vienna, where Zani found employment in service to the Hapsburgs. But when Caldara died in 1736, Zani moved back to the town of his birth, where it’s believed he remained for the rest of his life. An Internet article authored by Marcello Villa speculates that Zani may have traveled briefly to Paris, for many of his manuscripts have been found in libraries in the French capital. But details of his life’s work as a composer are sketchy. It’s known that he married a woman 27 years his junior and fathered seven children with her, and that his demise was an unnatural one; he died in a carriage accident en route to Mantua. Of his known works, both published and in manuscript form, are a set of Sonate da camera, op. 1, later reprinted in Paris as Sonates a violino solo e basso da camera, op. 3; Sei sinfonie da camera ed altrettanti concerti da chiesa, op. 2; Concerti dodici a quattro con i suoi ripieni, op. 4; Sonate 12 a violino e basso intitolate, “pensieri armonici,” op. 5; and Sonate a violino e basso, op. 6. The op. 2 concertos are the ones that appeared on the above-mentioned Symphonia CD reviewed by Maxham and Carter. Not mentioned in this list, however, are the 12 cello concertos on the present Capriccio set, nor does the booklet note identify the cataloger responsible for the “WD” numbers. We are told, though, that the manuscripts of these concertos are preserved in the Musical Library of the Counts of Schönborn in Wiesentheid, Germany, and that the performing editions were prepared by a Dr. Jill Ward, who also authored the album note. The 12 concertos are not presented on the discs in the order given in the headnote. I rearranged them in numerical sequence because it appears that Zani had an organizational plan in mind based on keys, at least up until the Ninth Concerto, at which point he abandons the systematic scheme. Up to that point, each concerto in a major key is followed by a concerto in the parallel minor key—e.g., A Major, A Minor; D Major, D Minor, and so on. Moreover, the pattern follows a precession of keys through the circle of fifths, beginning with the major key having three sharps, A, then falling a fifth to the major key having two sharps, D, and so on. The minor key relationships correspond, beginning with the minor key having no sharps or flats, A Minor, then falling a fifth to the minor key having one flat, D Minor, and then another fifth to the minor key having two flats, G Minor, and so on. To sustain the regression after the C-Major and C-Minor Concertos (Nos. 7 and 8), Zani would have had to number the Concertos in F Major and F Minor Nos. 9 and 10. Instead, he inserts a Concerto in B♭ Major as No. 9, and then gives us the Concerto in F Major, No. 10, only to follow it with another irregularity, No. 11 in E Minor, before finally arriving at the F-Minor Concerto, No. 12, which corresponds to the F-Major Concerto, No. 10. All of this, of course is purely speculative, being based on the assumption that Zani had such a reverse circle of fifths idea in mind. But if he did, it’s easy to see the problem he faced and to understand why he broke off the design where he did. Had he continued on, making the F-Major and F-Minor Concertos Nos. 9 and 10, as the sequence dictates, he’d have found himself in a bad place for the last Concerto, No. 12. He’d have been okay for No. 11, which, according to the plan, would have been in B♭ Major (two flats), but No. 12 would then have had to follow in B♭ Minor (five flats); and no composer I know of in the 18th century would have written a work for strings, much less a cello concerto, in such a remote and impractical key. If only Zani had begun his sequence one step higher—on E instead of A—he’d have come out fine. But then E Major wouldn’t have been any happier a key for the cello than B♭ Minor, both of which exclude the use of three of the instrument’s four open strings. I mention this because many music lovers are taken with the idea that composers choose keys for their works based on some emotional quality or character associated with them, when in reality the choice is often guided by mundane, practical considerations of range, notation, and other technical aspects of the instrument(s) being written for. That’s why until well into the 19th century, when wind and brass instruments finally gained all of their keys and valves and reached their modern states, very few orchestral works were written in keys of more than four sharps or four flats, and up to three was the norm. But I digress. Zani’s concertos are clearly products of their time and place. They all conform to the three-movement, fast-slow-fast layout of the Italian Baroque solo concerto, and adhere to the ritornello principle in which the orchestra, consisting solely of strings and continuo, offers up a basically repetitious vamping chorus, serving as opening, closing, and intervening sections that alternate with virtuosic display passages for the soloist—in other words, Vivaldi. Stylistically, however, Zani’s concertos sound just a bit later than Vivaldi’s (which, of course, they are), but not by much. Perhaps a closer contemporary to Zani, who is also known for composing cello concertos at exactly the same time, is Leonardo Leo (1694–1744). The configuration of the Cologne Academy seems a little odd, pitting only one each of viola, cello, and double bass against six violins. Perhaps, however, this was intended to insure that the lower orchestral strings wouldn’t overpower the solo cello. In any case, harpsichord, organ, theorbo, and Baroque guitar are variously employed to shore up the lower lines so that no weakness is felt in the bass. Zani’s concertos not only add 12 splendid specimens, all thoroughly enjoyable, to the existing Baroque cello concerto repertoire, they provide further evidence that composers of this period writing cello concertos is not the rarity it was once thought to be. For the most part, you’d be hard-pressed to realize that soloist Martin Rummel and the Cologne Academy are playing on period instruments. Rummel is incredibly adroit in the flashy finger and bow work Zani’s scores demand, and Michael Alexander Willens leads the Cologne ensemble in strong, energetic, and alert performances. If Vivaldi didn’t write enough cello concertos for you, and you’ve already sampled Leo’s contributions and like them as well, I can think of no reason why you wouldn’t find Zani’s concertos equally satisfying. Strongly recommended.